The majority of spend on demand-side platforms (DSPs) continues to come through managed services and networks, but their hold is giving way to trading desks and the marketers themselves. That’s according to Casale Media’s Index Quarterly Report Q1 2014, which looks at data from U.S. programmatic marketplaces. Brand marketers with a direct seat on major DSPs accounted for 11% of total U.S. spend on programmatic marketplaces last year. That represents 267% growth on the year, as brand marketers with a direct seat on DSPs accounted for just 3% of total spend to start 2013. Spend from marketers/agencies using a DSP as a managed service or through a network dropped below 50% of total spend last year and fell 18% on the year as a whole. Spend through trading desks rose 22% on the year, while spend from agencies remained flat, accounting for roughly 15% of total spend throughout the year. 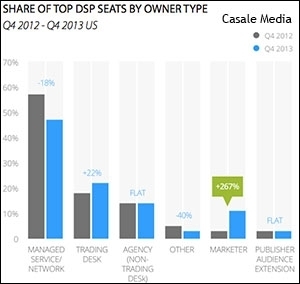 No other “DSP seat category” grew faster than "marketers" in 2013. The company has yet to run the “DSP seat” data for Q1 2014, so we have to wait and see if this trend continued into 2014. “We’re stricly reporting the data as we see it, and the trend is real,” said Andrew Casale, VP of strategy at Casale Media. As to why it’s a trend, Casale isn’t sure yet. “It remains to be seen whether it’s driven out of exploration and curiosity (i.e. marketers wanting to press the buttons on their own and see how the sausage is made) or something else,” he said.